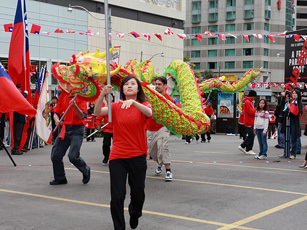 Dancers celebrate the national day of the Republic of China. 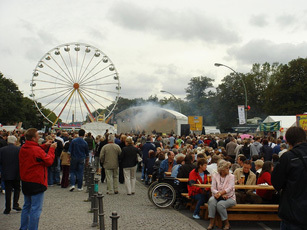 Citizens at a celebration in Berlin for German unification. Over the last week, countries around the world celebrated independence and national pride days. Bloggers in these countries posted their experiences. Lesotho celebrated its independence day on Saturday, Oct. 4. John, a doctoral candidate in Lesotho, writes that the day was relatively quiet compared to July 4 in the U.S.
Germany celebrated Unification Day on Oct. 3, commemorating the country’s 1990 reunification. A resident in eastern Germany writes of continuing tension, but is confident that the country will overcome lingering bitterness. Guinea celebrated its independence day on Oct. 2. The “Fed in Guinea” blog writes about being woken up by the sounds of drums, part of the dancing and festivities to come. The small island nation of Tuvalu celebrated its independence on Oct. 1. Paul Lyon’s provides a history of the day with an entry at “The Diary Junction Blog.” He also writes about “Treasure Island” author Robert Louis Stevenson’s visit to the island. Nigeria celebrated the anniversary of its independence on the same day, and the “Nigerian Adventure” blog writes about the country’s celebration of varying tribes and cultural heritage. China celebrated National Day on Oct. 1. “The Littlest Things” blog posts images from the day and some fun facts. Watch a video of Chinese fireworks here. Botswana celebrated 42 years of independence from Britain on Sept. 30. Bloggers and Peace Corps volunteers Richard and Stacy post a description of the celebrations, including dancing and bonfires. Croatia and Uganda will both celebrate their independence later this week, on Oct. 8 and 9, respectively. Photo courtesy of Flickr user SUN Eric under a Creative Commons license.